This Heuer Autavia 1163 Pre-Viceroy features a reverse panda dial with red accents and a black tachymeter bezel. It's a really good-looking racing chrono. In 1971, Heuer Autavia 1163 was part of the advertising campaign for Viceroy cigarette brand. The promotion included the reference 1163 with the caliber 12. The early specimens of the reference 1163 with lower serial numbers, as this particular watch, were visually identical to the Viceroy Autavia, but housed the caliber 11. This version of the reference 1163 is referred to as "Pre-Viceroy" among vintage watch collectors. The example offered here dates from the year 1970 and is in a fantastic overall condition. The matte black dial surface is free of any marks. The white sub-dials show the 30-minute counter at 3 o'clock and the hour totalizator at 9 o'clock. Both have been preserved greatly. The large 42mm stainless steel case of the Autavia has its unmistakable cushion shape. The fine lug finish is perfectly intact. The watch looks very solid on the wrist and is comfortable to wear due to the curved case shape. The chronograph pushers are fluted, the winding crown shows the Heuer logo. The original owner's initials R.W.N. are engraved on the case back of the watch. 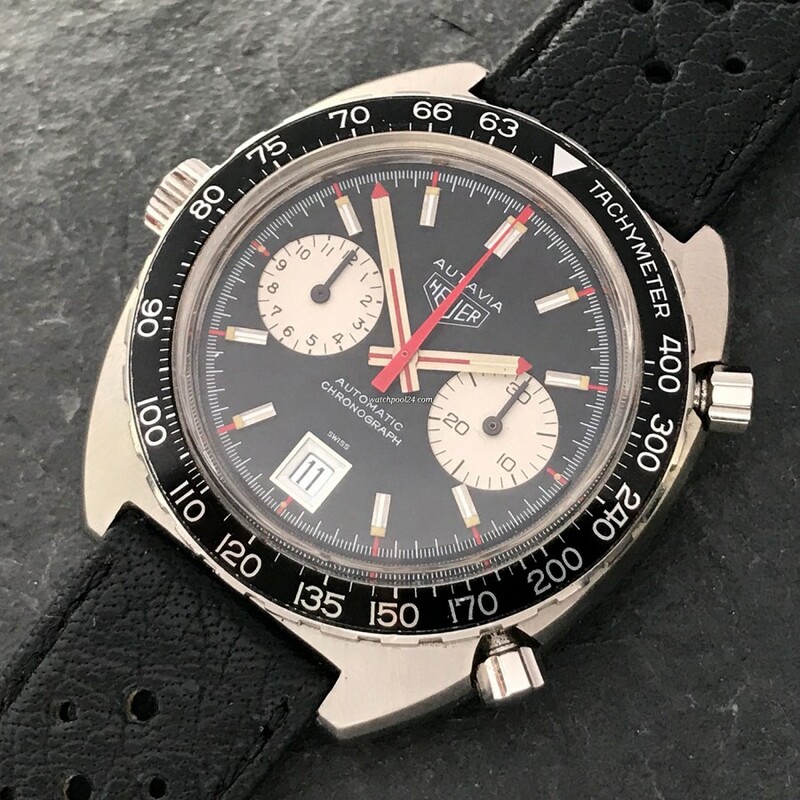 As already mentioned, this Heuer Autavia 1163 is powered by the legendary Calibre 11. It is one of the three automatic movements which were fighting in the race for the development of the world's first automatic chronograph. In addition, the watch offers a date display at 6 o'clock. All functions are in perfect and running order. The motorsport background, sporty look, legendary movement and a beautiful condition make this Heuer Autavia the perfect vintage collector's watch.